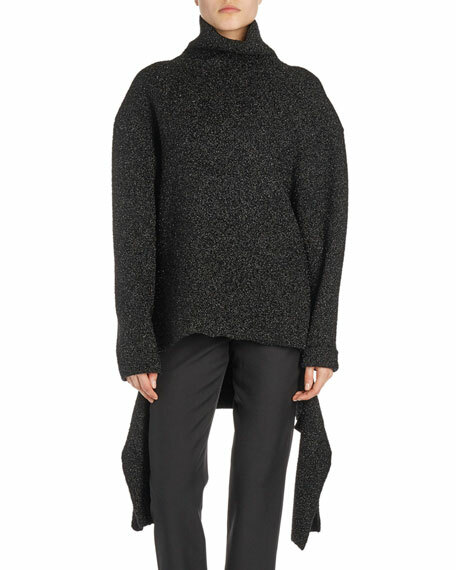 Balenciaga metallic knit sweater with side sashes that may be worn draped or tied. For in-store inquiries, use sku #2173728. 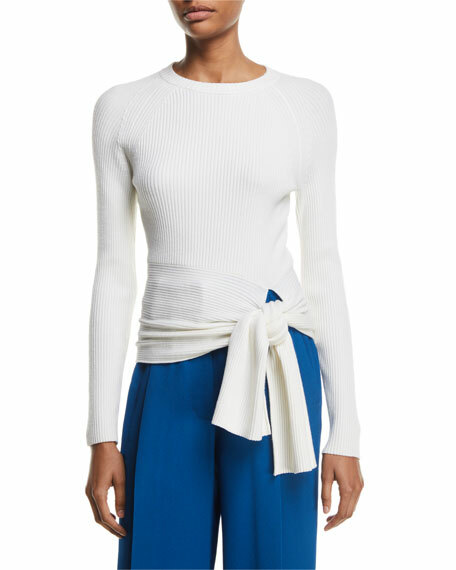 3.1 Phillip Lim ribbed sweater with adjustable ties at waist. Crew neckline. Long sleeves. Fitted silhouette. Pullover style. Wool/spandex. Imported. Model's measurements: Height 5'11"/180cm, bust 32"/81cm, waist 25"/64cm, hips 36"/91cm, dress size US 2/4. 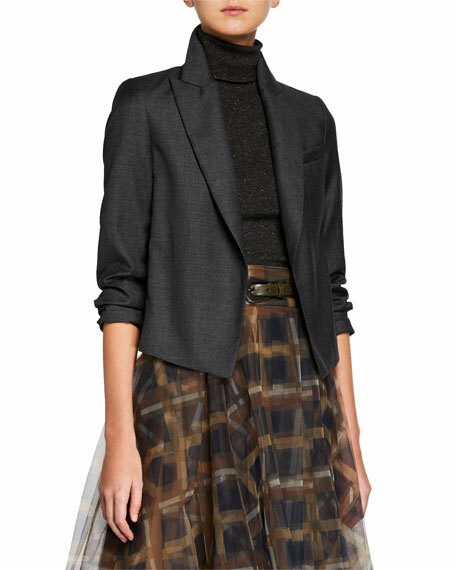 Brunello Cucinelli blazer in virgin wool twill. Peak lapel; hidden one-button front. Long sleeves. Hip length. Semi-fitted. Virgin wool. Lining, acetate/silk. Made in Italy. 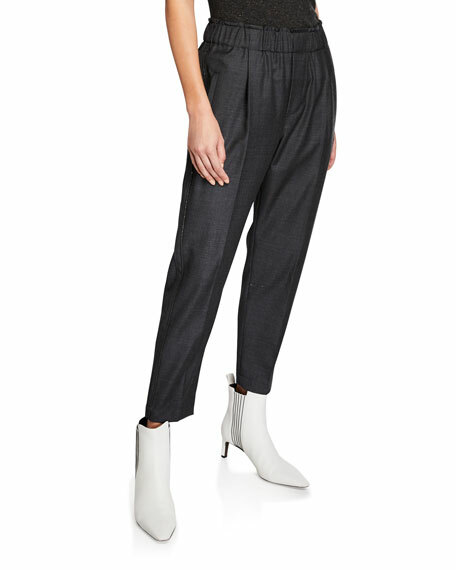 Brunello Cucinelli pants in sharkskin wool. Monili tuxedo stripe. High rise; smocked waistband. Straight legs. Cropped above ankles. Pull-on style. Virgin wool. Lining, polyester/acetate/cupro. Made in Italy. 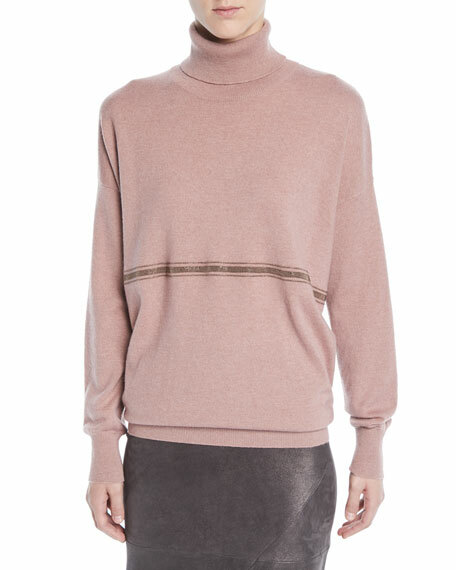 Brunello Cucinelli sweater with monili stripe. Turtleneck. Long sleeves. Relaxed silhouette. Monili stripe front. Banded cuffs and hem. Pullover style. Cashmere. Made in Italy. Model's measurements: Height 5'10"/177cm, bust 31"/79cm, waist 24"/61cm, hips 34"/86cm, dress size US 0/2.